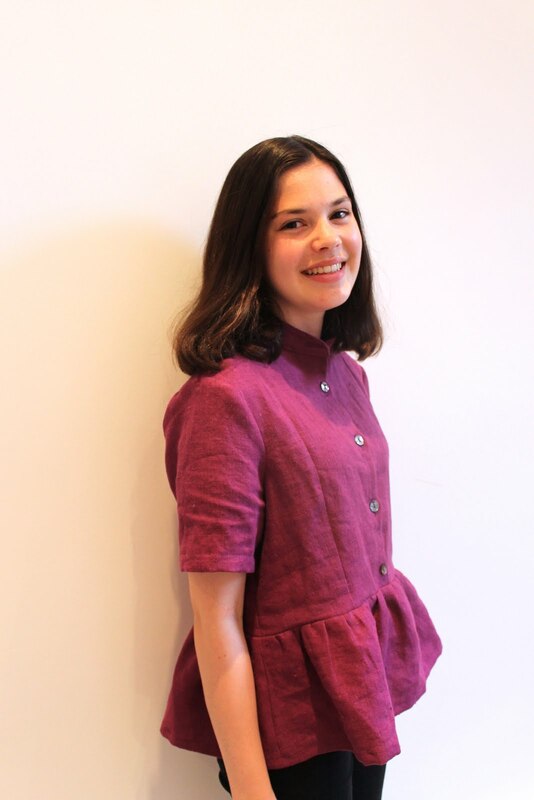 Very excitingly, I was a pattern tester for the new Coco Wawa Crafts sewing pattern: the Honeycomb shirt and shirtdress which launched a few weeks ago. The pattern has several variations but I decided to sew the shirt version which features a peplum and a mandarin collar. To be honest, I wasn't sure about the style of this shirt at first. It's not something that I usually would wear, so I'm really glad to have had the opportunity to test out a pattern that I otherwise probably wouldn't have sewn. The only change I made to the pattern was to omit the bow ties which feature just above the peplum. I did this due to personal preference only, but it does mean that the waist is slightly boxier and less cinched in than it would be if there were ties. I quite like the loose boxy look, but it is something to bear in mind if you're making your own. What I absolutely love about this pattern are the gorgeous princess seams that run down the front bodice. I love the look that they give, the style lines are really lovely. I'd also like to experiment with hacking this pattern by using the top but not the peplum, as the bodice fits me really well. As a bonus, the princess seams mean that the top is really simple to fit too. As I mentioned at the start, this shirt is a slight departure to my usual style, and I think that this is mainly due to the mandarin collar. It's still growing on me, but I really enjoyed testing out a new skill. 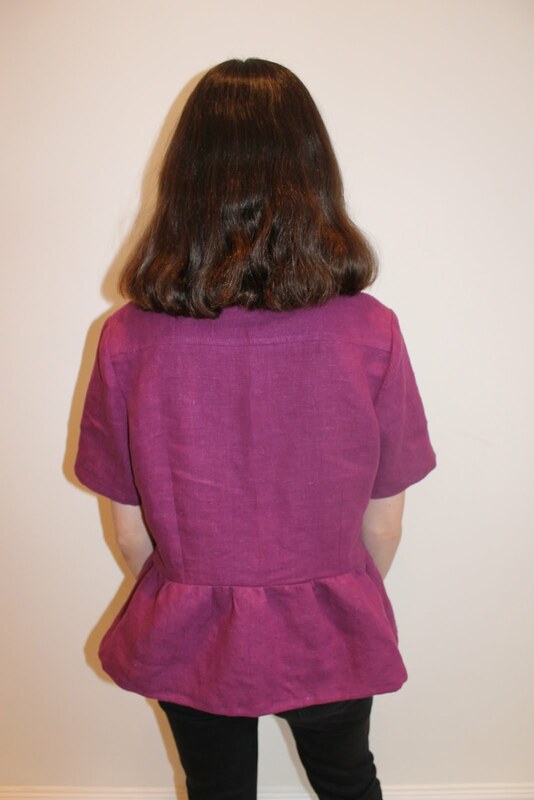 Sewing a mandarin collar is so much easier than sewing a normal collar and the instructions were great, so don't let that put you off! I did sew mine using a slightly different method which is something I usually do with collar stands. Rather than sewing the outer collar stand to the neck and then topstitching form the right side hoping to catch the inner collar, I sewed the inner collar stand to the neckline right sides together and then sewed the outer collar down by topstitching around it. I hope that makes sense! I did this in order to make sure that the inner collar stand was definitely properly sewed down, as I often find that if you sew from the right side it's often hard to catch the part underneath in you stitching. I think that the buttons are one of my favourite aspects of this top. Again, I had them already and was delighted to see that they match the purple linen so well! 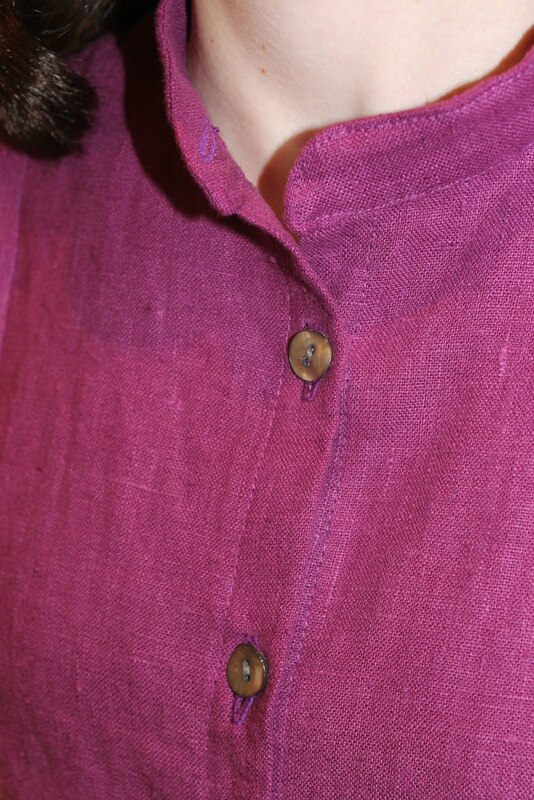 I took my time sewing the button stand, collar stand and buttonholes and I love this photo of the close-up details. This top was definitely a bit of an experiment for me, both with the colour and the style. I do really like it though, and as I said it's nice to sometimes be pushed to sew things that one wouldn't usually sew. I'd love to make more of these tops, a blakc viscose one is definitely on my list of things to make. On my next version I think I might size down too, or at least sew with a slightly larger seam allowance, but then again a drapier fabric would probably make it look less boxy anyway. I think it paid off that you tried something new! I love the color on you, and think the shirt is really cute! I think this one is different than your usual style, but very flattering and well done. The design in linen makes it a kind of polished casual. The color is excellent! I really like this shirt, it suits you perfectly. 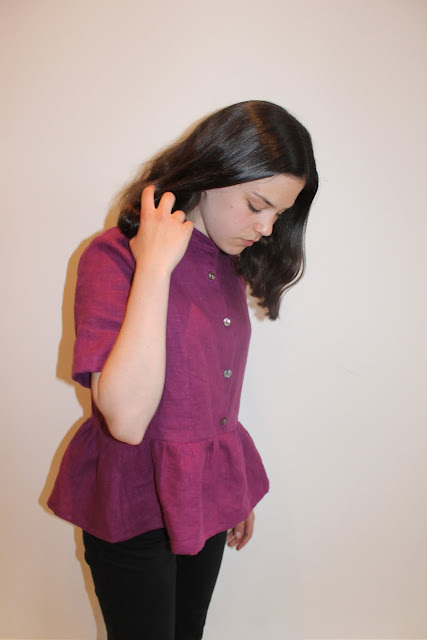 The colour is fab and I really like the peplum. I would love to wear a peplum shirt but I don't think with my body shape I can get away with it. 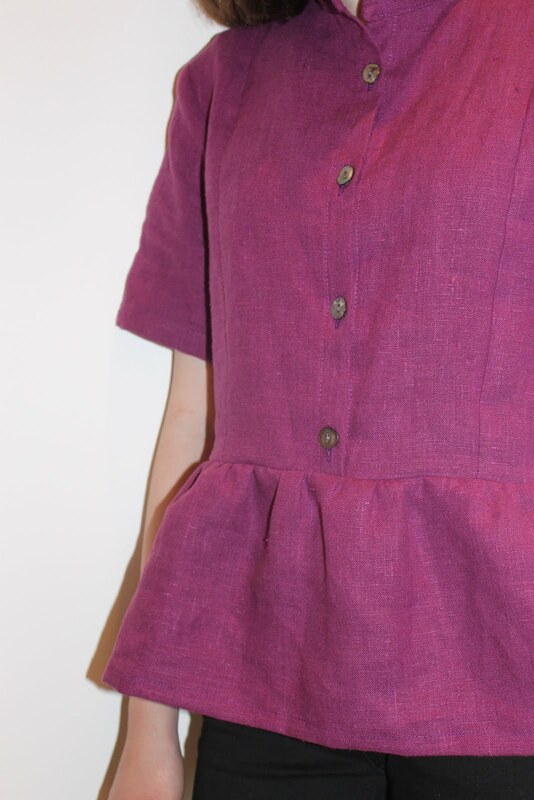 I had forgotten how much I love to sew with linen, I'll have to do this again soon. Have a lovely week. This is such a pretty colour on you and I like the new silhouette. I have some green linen in my stash which you have inspired me to use for something! Fab that you go to stretch your sewing muscles being a pattern tester too. Such fun being involved in a project before it gets launched to the public!